As mansions give way to modest houses and then to apartment complexes, a patch of wildland sits within the roar of I-90 on the downslope of Spokane’s South Hill. In this swatch of scrubby trees and holly leaves, where sidewalks once went somewhere but now just end at a few posted “No Trespassing” signs, sopping blankets and sleeping bags mark where a few people once slept — and perhaps continue to sleep — without a roof, walls or heat. It’s not an uncommon sight in the Inland Northwest: camps abandoned by the homeless, out of sight but everywhere. Hidden in plain view — it’s something that could be said of every homeless person, whether in a shelter, in transitional housing or in his car. 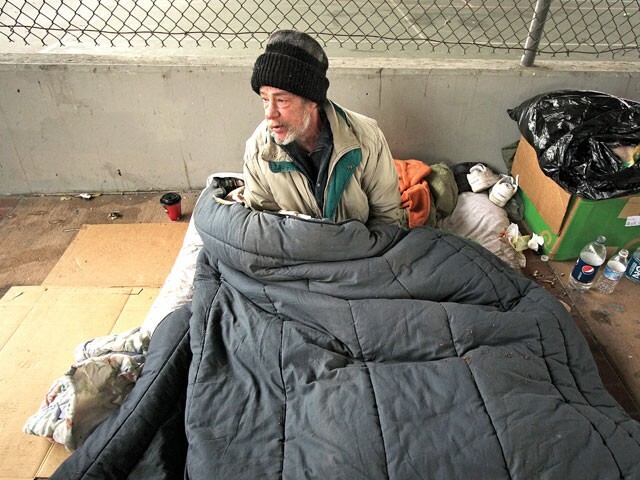 According to Spokane County’s latest count, the number of homeless within the city dropped by almost 20 percent in the past year, while the number outside the city increased by 72 percent. Overall these numbers are showing a decrease, down 10 percent from the previous year. But many are saying this just isn’t true. “I’m seeing lots of new faces and still seeing the old people,” Jacoby says. “A lot of people have that deer-in-the-headlights look, like, ‘I never thought this would happen to me.’” But it does, and Jacoby says there are “a million” ways someone loses shelter. One of the cracks that almost everyone mentions was the closing of the Otis Hotel, the Morrison and the Martindale. Those three buildings provided 270 single-resident occupancy rooms, most of them affordable for those on the state’s “General Assistance Unemployable” program, which gives a scant $339 a month. Peeler says one simple solution to this complicated problem would be the establishment of a “centralized clearinghouse,” where homeless people can go to one location or one Website and find a place to sleep. He says this would especially help with families. Pfundt, who works predominantly on housing and public benefit issues, says he recently worked with a wheelchair-bound woman prescribed to 24 different medications who had received an eviction notice. The day her locks were supposed to be changed, she was in the hospital, having just suffered a stroke. “About 80 percent of low-income people can’t get legal assistance for problems that affect basic needs,” Pfundt says, adding that the Justice Project helps fill that hole.